Investors will be focused on revenue growth, margins, and asset sales updates when the Chinese search giant releases its fourth-quarter results on Thursday. 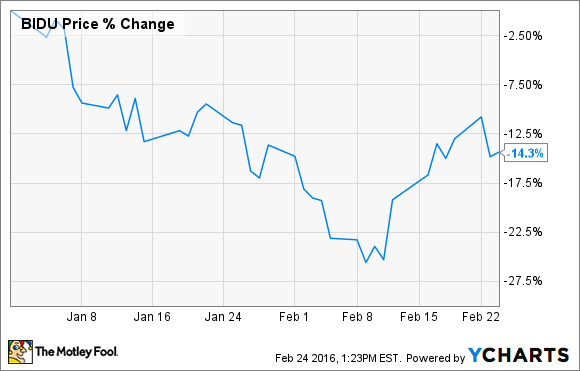 It's been a volatile ride for Baidu (NASDAQ:BIDU) so far in 2016. By early February, shares of China's leading search engine had fallen more than 20%, as fears regarding China's slowing economy peaked. As global stock markets have rebounded off their lows in recent weeks, Baidu's shares have recovered some of their losses. Yet the volatility is likely to continue when Baidu reports its fourth-quarter results on Thursday after the market closes. Here are some key items to watch for that will likely determine whether that volatility tilts to the upside or downside. In its third-quarter earnings press release, Baidu's management issued Q4 revenue guidance in the range of $2.864 billion to $$2.950 billion, which would represent a 29.5% to 33.4% year-over-year increase. Investors will want to see revenues near the top end of that range. But shareholders will be even more eager to hear management's sales outlook for 2016. If Baidu indicates that its torrid pace of revenue growth can continue in the year ahead, investors will likely rejoice. A substantial deceleration from the 30% growth range, however, may be met with selling. Investors' patience with Baidu's money-losing ancillary businesses is beginning to wear thin. The company's strategy to diversify into high-growth, lower-margin businesses such as streaming video, app marketplaces, and group-buying websites has helped to boost revenue growth, but has taken a toll on profitability. Sophisticated investors know that it's ultimately profits that help to determine a business's long-term value, and shareholders will be looking for evidence that Baidu's heavy growth investments are beginning to bear fruit. Baidu shareholders will likely have to suffer through at least one more quarter of declining margins and profits: It's earnings are expected to decline by more than 20% in the fourth quarter. But long-term investors will be more focused on management's comments regarding any possible margin improvements -- and a corresponding return to earnings growth -- in 2016. One way that Baidu can rapidly improve its profit margins is by selling off some of its money-losing businesses. Rumors that the company was considering doing just that began to intensify in January, and just weeks ago the company announced that it had received a buyout offer for its iQiyi video streaming site. Investors will be listening intently during Baidu's conference call for updates regarding this situation, as well as any comments by management that help to shed light on the company's future asset monetization plans. Investors can tune in to Baidu's live conference call, where management will discuss the quarter's results, at 8 p.m. ET Thursday. Both the earnings release and a link to the conference call will be available at the company's investor relations website. Will Tencent Challenge Baidu in the Driverless Market?